Home | Blog | Professional Roofing Equipment: The Advantage Your Bottom Line Needs – Guest Post by Our Friends at Equipter!! The bottom line matters–especially in a competitive industry like roofing. One way to give your contracting business a significant advantage over the rest of the roofing pack is by investing in professional-grade roofing equipment. Learn how these investments will build your bottom line. If you’ve been in the roof replacement industry for any length of time, chances are good you already have a well-established roofing process. For example, many crews rely on traditional equipment, like tarps, plywood, trailers, and dumpsters, to manage debris and material. However, newer roofing equipment, like the Equipter RB4000 roofing trailer, is designed specifically to streamline debris handling. You can tow the unit to the jobsite, and then use its engine to drive and position it virtually anywhere on the property, even right next to the building. Once it’s positioned, you load tools and materials into the container and raise it up to 12 feet high, saving crews the time and hassle of lugging everything up the ladder. Then, during tear-off, debris, like worn shingles, nails, and packaging materials, go directly into the raised container instead of onto the ground. When the RB4000’s container is full, simply lower it and drive it to a nearby truck or dumpster. 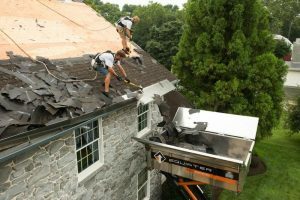 When roofers spend less time on job set-up and clean-up, you can shave significant time–in some cases–hours off the day. Professional roofing tools, like Dataforma, will boost field productivity as well. When your team has the power to efficiently communicate, send photos, and collect digital signatures, it creates a simplified, streamlined process that reduces time spent on routine tasks. Those time savings add up, allowing you to complete more jobs in less time–and that’s always good for the bottom line. Roofing is hard work, and even though crews take pride in the work they do, no employee likes to feel worn down by the end of the day. When you invest in professional roofing equipment, you can save significant physical wear and tear on the body. In the roofing industry, injuries stemming from falls, punctures, and strains are all too common. And sometimes these injuries happen because a worker becomes fatigued after long, hard hours on the jobsite. Over time, injuries will ding your bottom line, from downtime due to absenteeism to increased worker’s comp costs. By investing in professional roofing equipment, whether it’s as simple as a magnetic nail sweeper or as specialized as an Equipter RB4000, you help crews better protect their bodies and you help your company protect its bottom line. The labor market can be a challenging place, especially for an intense job like roofing. About 56% of general contractors say they have trouble finding qualified roofers, according to the National Roofing Contractors Association. Hiring and retention cost time and money. For example, costs for hiring usually include advertisements as well as time spent slogging through applications and conducting interviews. If the hire doesn’t work out, you’ll have already paid out wages and benefits, plus you’ll get stuck with the costs for downtime (or overtime!) when an exiting employee leaves a gap in your crew. In some cases, a bad hire can even lower morale and team productivity. Using professional equipment, like the Equipter or Dataforma, allows you to attract and retain the high-quality workers you need to protect your bottom line. Skilled roofers will want to work for the roofing company that provides equipment to boost productivity and/or save wear and tear on the body. What’s more, you may be able to retain skilled older workers longer because equipment that specifically streamlines material handling can help reduce the risk of career-ending injuries. Give your bottom line the professional advantage. Whether you’re capturing homeowner signatures with Dataforma or shaving labor hours off the day with an RB4000, professional roofing equipment and tools can make a measurable difference on your bottom line.